This is the third part in a four part blog series on the science of free will. So far in this series, we've focused on scientists who are trying to disprove the existence of free will. But Jeff Miller of the University of Otago in New Zealand thinks these investigators have got it backwards. "We know it's almost impossible to prove that something does not exist (e.g. Loch Ness Monster)," says Miller. "Even after we have looked and looked, it is still possible that it's out there." So are there any researchers who believe their work provides support for free will? Yes. Björn Brembs, a neurobiologist at the Free University of Berlin, has found evidence of free will in an unlikely place: the mind of a fly. Even when put under strictly controlled stimuli, flies will act in unpredictable ways. Unlike a machine, which will always give one predictable output for one input, even a simple fly brain will react differently to the same input in multiple trials. This kind of variability might be even be an evolutionary adaptation to help animals escape predators. The more unpredictably an animal maneuvers when it is being chased, the more easily it can escape danger. Another use is in exploration. If animals never wandered around without a goal, they would not find new habitats and food sources. Variability is also important in learning. Brembs gives the example of a toddler learning to speak: At first the child is very variable in her language, saying "momoo, mumoo, momma" until she reaches the right word, "mommy." But, you might ask, maybe this behavior isn't truly unpredictable--maybe we just don't have complete information about what is going on in the brain and body. So, as Brembs describes in his paper, William Kristan ran an experiment on a nervous system about which he did have complete information and control. Leech nervous systems were removed and isolated, this way they could not be influenced by the body or any other stimuli. When hit with the same electrical stimulus, the nervous system sometimes chooses a swimming behavior and sometimes a crawling behavior. The choice can not possibly be based on an outside stimulus, or a stimulus from inside the body since it does not have one, as the Harvard Law of Animal Behavior states, "under carefully controlled experimental circumstances, the animal behaves as it damned well pleases." This shows that there is no "hidden" signal causing the animal--be it a leech or a fly or a human baby--to act the way that it does. There is a true element of randomness that defies the notion of perfect determinism. Through the analysis of this variability, Brembs argues, "Free will becomes a quantitative trait." According to Brembs, randomness is everywhere in the universe--"free will" is the brain's process of selecting among all of the randomly-generated alternative possibilities. But how do we make the evolutionary jump from flies acting unpredictably to humans making free decisions? 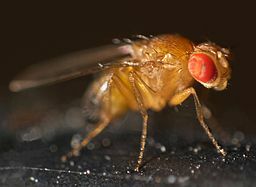 "The behavioral variability of the fruit fly is like a grain of sand in a pearl," says Brembs. "Subsequent evolutionary inventions have been layered on top of it. If you didn't have that grain that was invented fairly early in evolution, you wouldn't have the pearl." The pearl here is human free will. Brembs finds the basis for free will in the laws of quantum physics: "Since Heisenberg's uncertainty principle, no one can claim to be a determinist anymore...Determinism has been falsified by 90 years of quantum mechanics....The brain is not in a deterministic bubble in an otherwise quantum universe." He pointed out that quantum processes have already been witnessed in plants and animals. For those interested in the motivation to study free will, Brembs did make a point to mention that he did not approach, and still does not approach his research with the goal of making any comment on free will. He said of work done on the variability of flies, "I had never used free will when talking about it, ever." A reminder that that scientific research can add interesting insights into a discussion of free will, but the philosophical discussion is entirely separate. If the function of our brain is not entirely predetermined then there is a possibility for us, both humans and all organisms containing a nervous system, to decide our own actions. This gives free will a place in the biological world. The first step of free will is freedom and Brembs has proven that animals act freely--they do not always respond in exactly the same way. The mechanism for how they exercise the next step, the will, is still being researched. But if we keep looking into the "grain of sand" in flies and other "simple" creatures we may eventually begin to understand our own human "pearls."